You can fulfill your deepest wishes and hopes. You can be the designer of your own glorious future. The whole world is ready and waiting to support your desires! 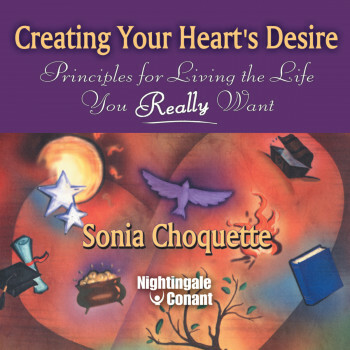 Now you can learn how to jump-start your own “dream team” with Creating Your Heart’s Desire life-changing program by internationally-renowned spiritual consultant Sonia Choquette. You can fulfill your deepest wishes and hopes. You can be the designer of your own glorious future. The whole world is ready and waiting to support your desires! What is your heart crying out for? What has been holding you back from living your dreams? There is a song deep inside you waiting to be sung. When you sing it out, you will invite a waiting partner—the Universe—to join you in completing the melody of your life’s destiny and purpose. Now you can learn how to jump-start your own “dream team” with Creating Your Heart’s Desire, a life-changing program by internationally-renowned spiritual consultant Sonia Choquette. When you apply Sonia’s principles, the positive changes in your life will truly astound you. Creating Your Heart’s Desire is not a one-time “quick fix.” This program is a lifelong tool for achieving your core purpose in life. As you become more and more familiar with the Principles of Creativity, you will find yourself using them on a daily basis to make your desires real. As you travel through life’s stages, your needs and desires will change. That is why you will return to this inspired program time after time for renewed focus, guidance, and inspiration. Whether your heart’s desire lives vividly in your imagination, or is a hazy, silent longing without shape or form, Creating Your Heart’s Desire will lead you from where you are to where you want to be.